Must be 10:30AM when we arrive at Wakkandurga. 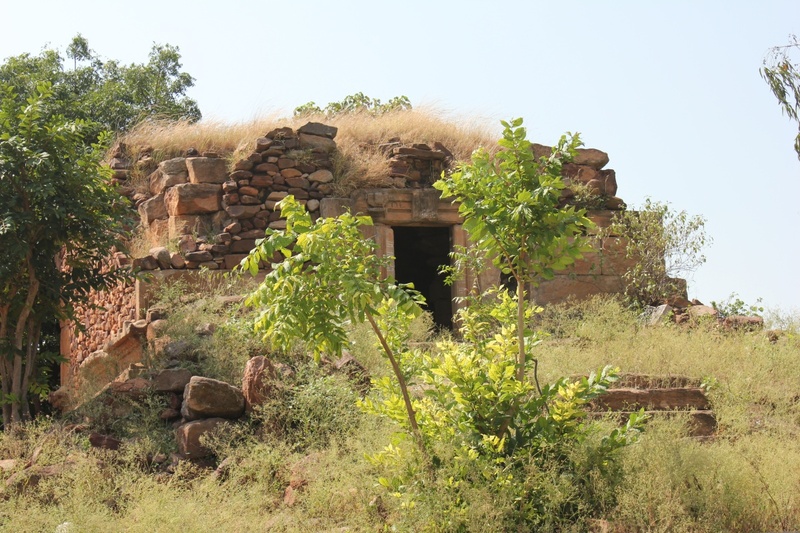 Wakkandurga hill, a fort at the top and a temple half way up sits peacefully at the edge of this village. 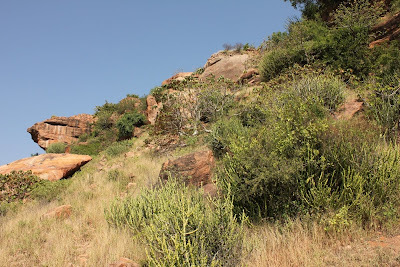 Shivu finds a shady spot near the hill for his Indica while I look around for a suitable guide. 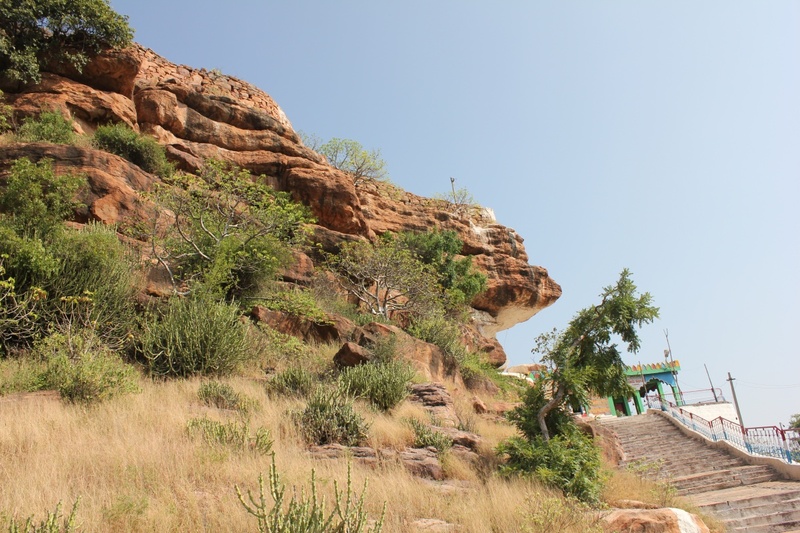 Right on time, Hanumantappa is passing by, I ask him if he can show us the fort, he was little hesitant but did not take much time to agree. Durgadevi temple. 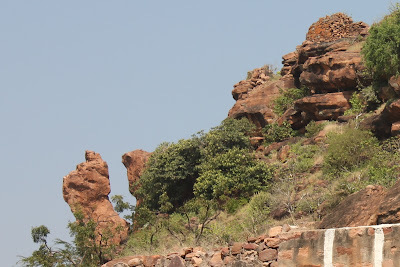 Deity is in a natural cave like formation in the rocks. The cement and paint structure is merely a shelter for devotees. 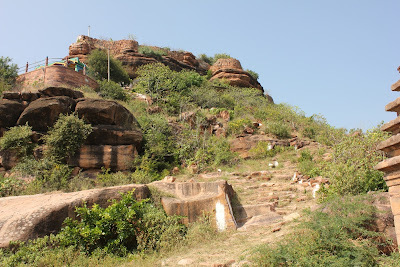 At the base of the hill where a flight of steps began, our guide asked us to leave our slippers. 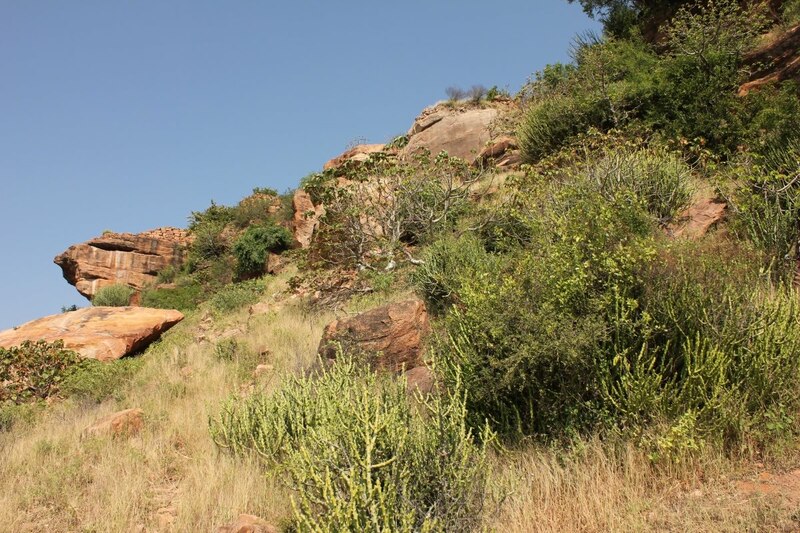 I saw the hill, no path visible, only spiky grass and thorny shrubs ...how am I supposed to climb this hill bare-feet? We visit the temple first and then start climbing towards the fort. A short climb but progress was slow. Earlier a path with steps did exist. 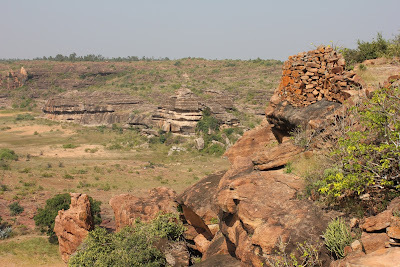 About two years back a huge rock broke off from the hill and destroyed it. 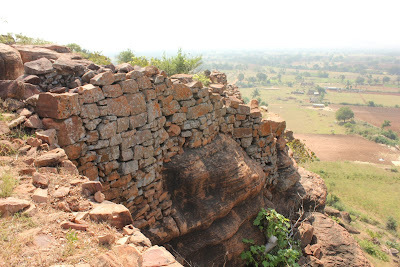 Shivu, close to the fort entrance is standing just above point of separation. 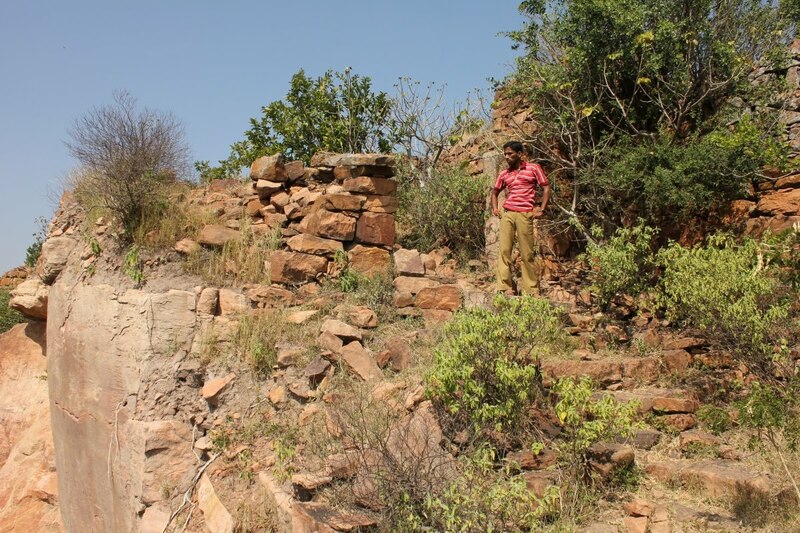 The separated rocks slid down and crashed into four houses close to the base of the hill. Four people were killed in the incident. 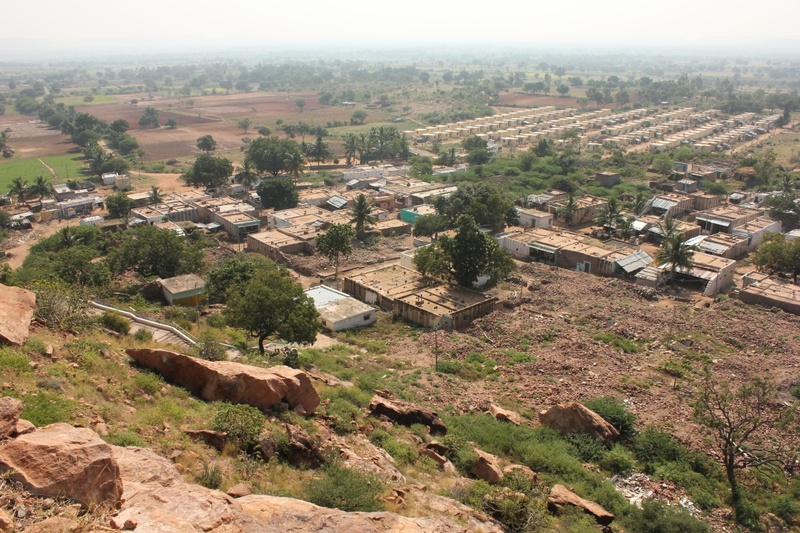 Fearing safety several families vacated their houses and moved into a government constructed colony nearby. The colony can be seen in the background. The summit is uneven and wild. 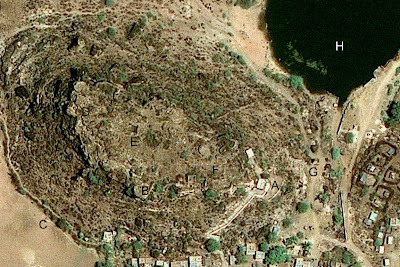 Plan of Wakandurga hill & fort in Google maps. We explore the eastern part of the fort. Not exactly a dolman, perhaps it is an ancient burial chamber. Whatever it is, now it's a nice little shelter for shepherds. Tip of the overhanging part of the fort. 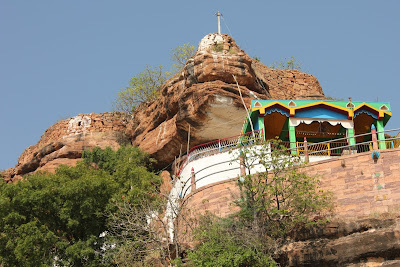 Hanumantappa asked if I wanted to go to the edge and see the temple below. With the Sun almost at the top we were behind schedule ...no, we'll explore the western end of the fort. During Dasara celebrations, a local sport was to bring a thumbid-cheela (sack filled with grains weighing between 100 and 110 kilograms) from the base of the hill to the top here without putting it down. One tough challenge that would be! The winner would get cash prize. The raised platform. 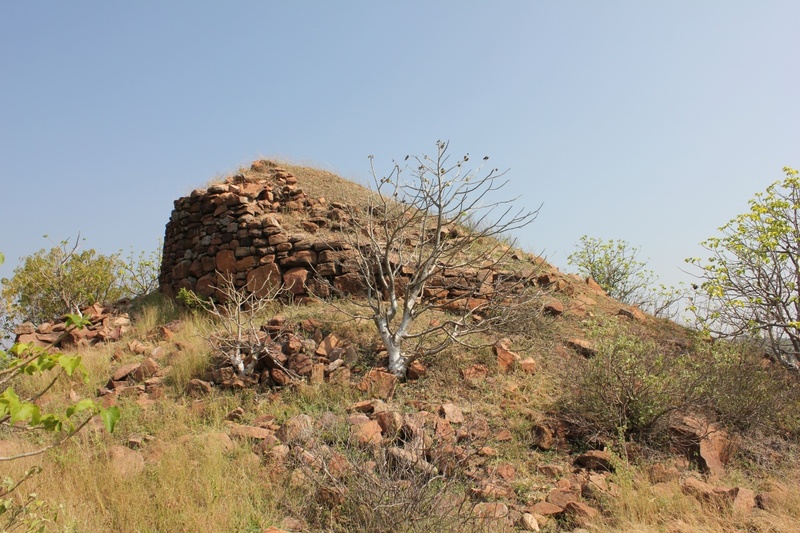 Twanpanigida, plant with silver stems is all over this fort. I was amazed at the stems, big or small plants they had stems as though it was painted with silver. The plant is not exactly useful to either humans or animals. A dry plant yields light wood which burns fast. 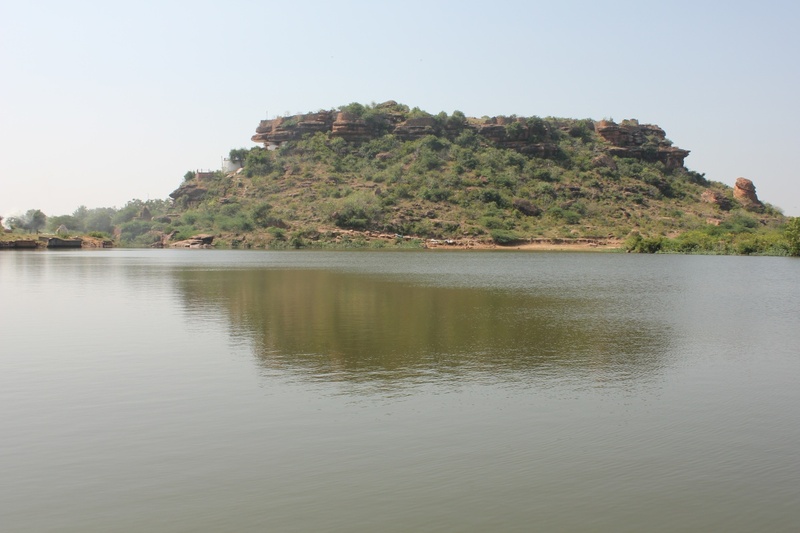 Wakkandurga lake is clean and well maintained. Rain water from the hills flows down, collects here and excess water flows away. 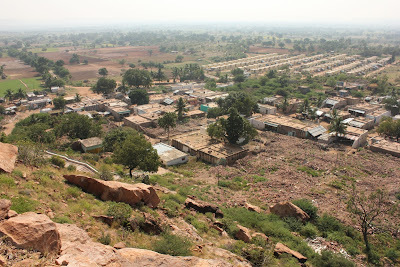 Hanumantappa told us that the entire valley looks like a river during a good rainy season. The western half of the fort and hill tops beyond the valley. We walked along the edge of the summit towards the western tip of the fort. Wall built to fortify natural defenses. 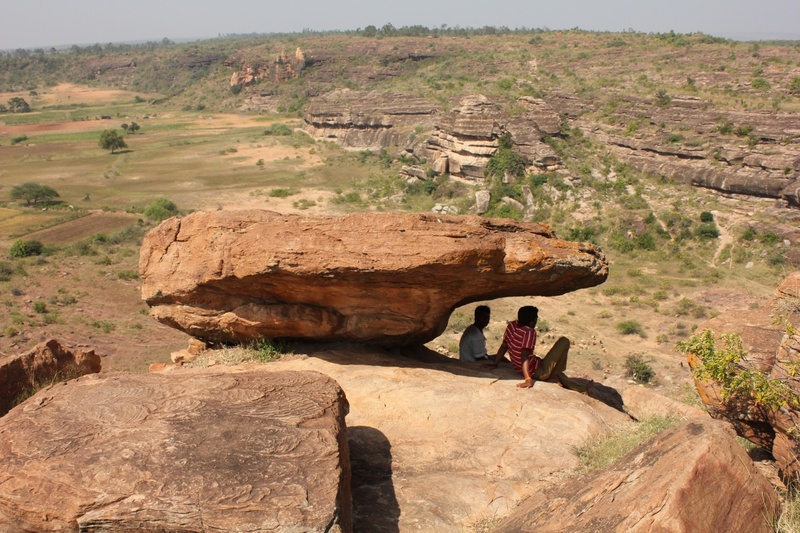 A natural shelter under which Hanumantappa had spend many of his childhood days along with his friends. 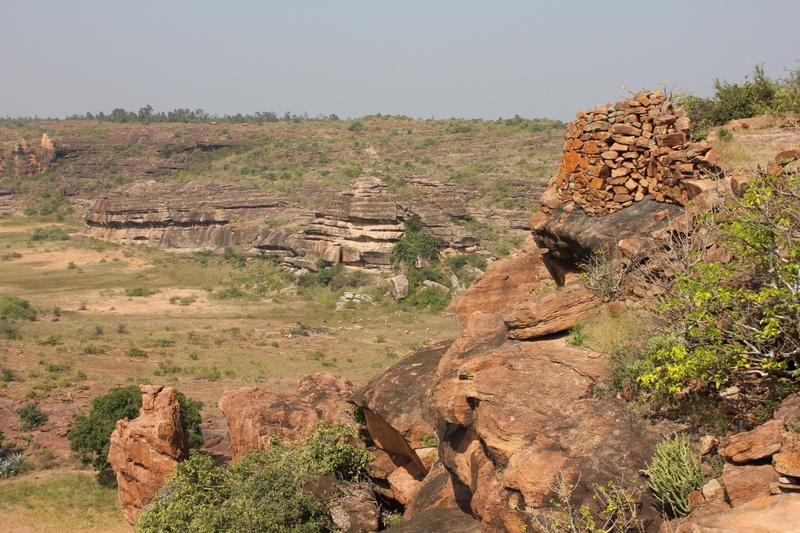 Hanumantappa pointed out to a clump of eucalyptus trees on a hill towards North-West "that's where Pattadkal is. we have walked to Pattadkal many times through these hills". Half standing structure which could be a officers quarters. From here most of the fort is visible clearly. 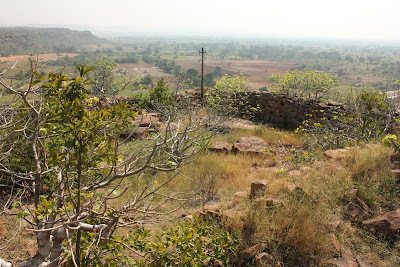 Of course this point also gives a good view of the valley and surrounding hills & plains. Down below close to the base of this hill three young boys were playing in hay spread out for drying. We could hear their voices. Two of them had buried one :) ...I wish I could go back to those days. We move back to the center, to Hanumantappa's left is tank to store rain-water obscured by plants growing out of its walls. 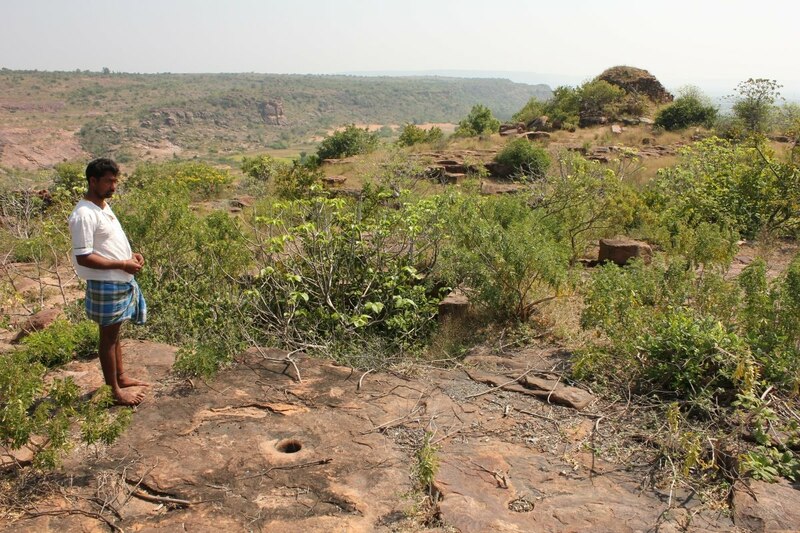 To his right a dead hole used for grinding masala. Someone from the group suggested I see the Jain Basti, a minutes walk from the base of the hill. The temple is in a bad shape. 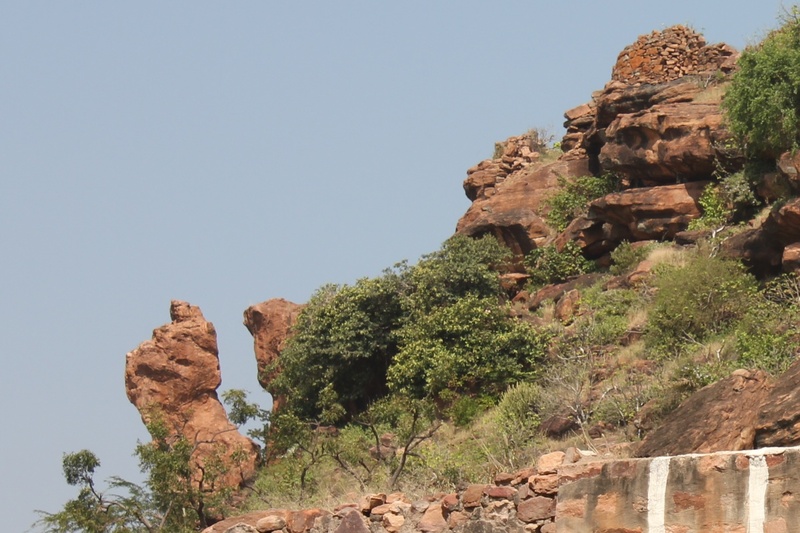 Note the feet shaped rock close to the bottom-left corner. Except for the thumb rest of the toes are missing. 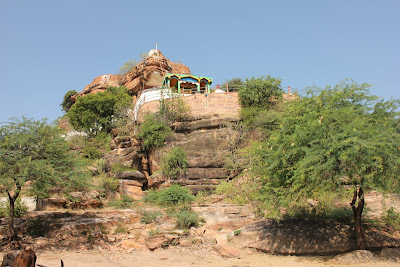 Original steps leading to the temple. 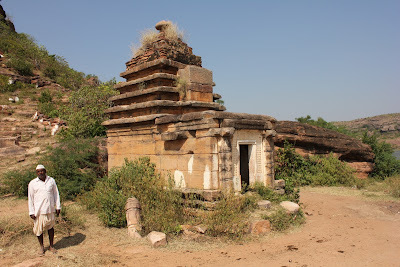 A small temple dedicated to Shivaliga. Lake, hill & fort of Wakandurga. I washed my feet at the lake. Very close to where I'm standing are two more shrines, one of them is supposed to be a sister deity of the deity of the hill temple. I really want to come back here during a good rainy season. We said bye to Hanumantappa and moved to our next destination- Chikanal. Wow , nice to know about this fort .Wonderful pictures . Very nice coverage and good photos as always. I really appreciate your job. This is really a valuable encyclopedia showcasing our past glory. 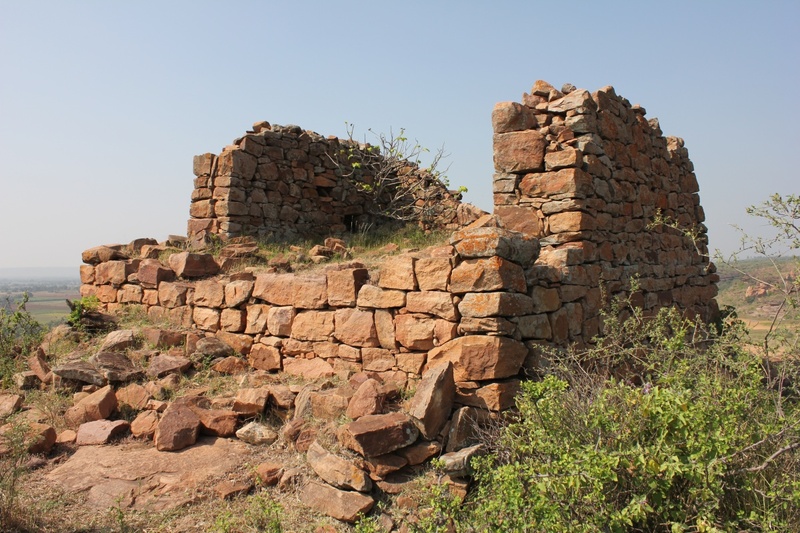 I really feel sorry for the ruined state of most of the monuments with no proper attention from authorities and the local people who have no interest in preserving it for the future. 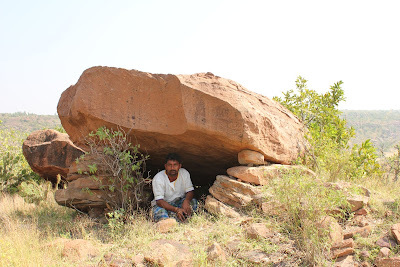 I have seen many places where locals are using the sites for the domestic purpose. I am from Dharwad, but unfortunately work and stay in Germany. 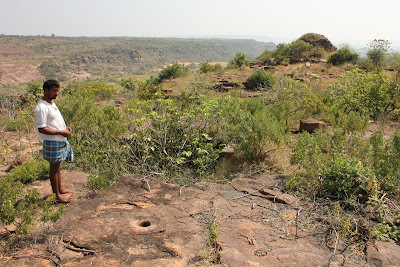 But when I am in Dharwad, I do not miss the chance to visit the ancient sites in and arround. Last year (2011) I visited Karadagi near Haveri. 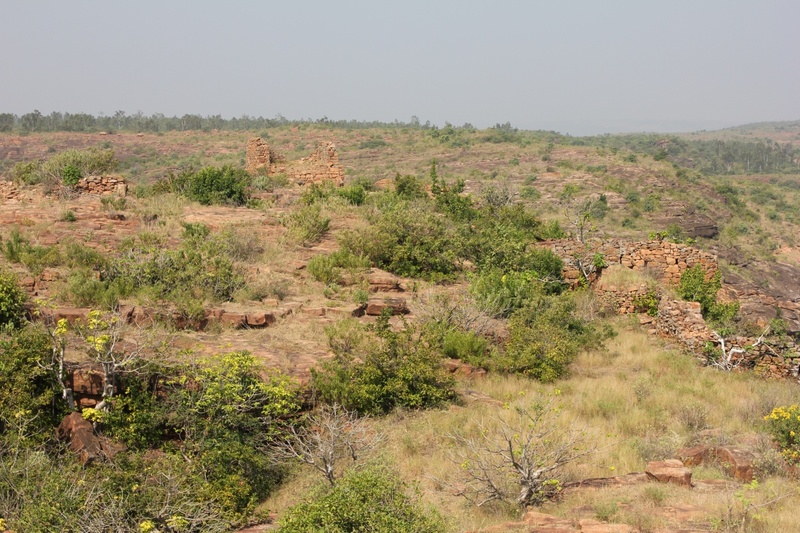 The temple is completely ruined and partially buried. If efforts made this temple could be built. I was really facinated with the artistic work on the stones. May I kindly ask you to visit this site and share some photographs? Thank you Shivakumar. 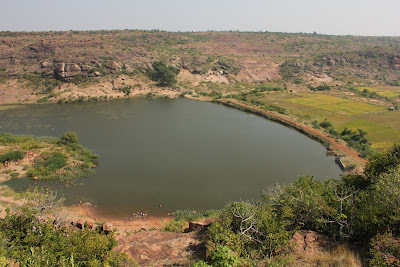 I'll remember to visit Karadgi when ever I visit Haveri district. 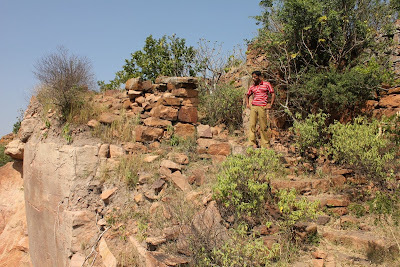 Coming to maintaining monuments, its not an easy task because India has thousands of monuments. However, people need to be educated and awareness about the importance of our monuments has to be spread.